Back in 2005, Brazilian guitarist/vocalist Badi Assad toured throughout the universe with two iconic American guitarists, Larry Coryell and John Abercrombie. They landed in Minneapolis for a night at the Dakota. 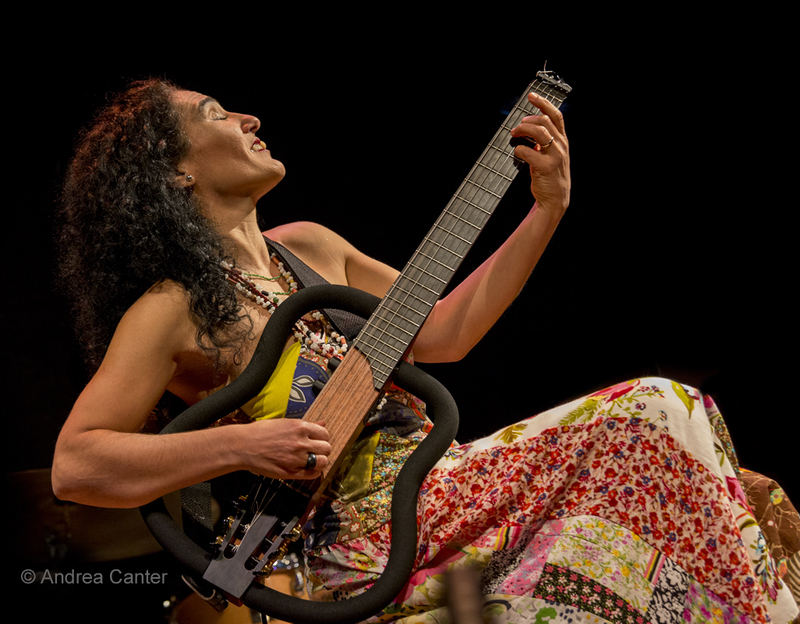 In addition to the guitar, I recall an odd tube-like “instrument” that Badi used to add another dimension to her already stunning music. But it was a guitar show and she was but one-third of the attraction. Eight years later, Badi returned to the Dakota with her own back-up team (drums and bass), and this time the focus was on the voice and the songs that have made her a pop/rock star in Brazil and beyond. But it wasn’t her ethereal renditions of Tori Amos or modern Brazilian hits that really captivated my attention – her talents are indisputable but there are a lot of talented pop and rock singers out there, even those who bring along the added talent of guitar and/or piano. Toward the latter part of the set, Badi mentioned that she might be described as part Tori Amos, part Bobby McFerrin. An odd combination, certainly. But a fair summation of her solo work at the Dakota as she gave us what can only be described as vocal magic. Like McFerrin and Theo Bleckmann, Badi is not content to merely “sing”. Like a saxophonist using circular breathing, or one of the reed players who manages to blow through two horns at once, Badi finds air in more than one place and creates simultaneously very distinct sounds—such as the percussive pops of McFerrin in harmony with longer, more voice-like tones. Add guitar and she is a one-woman orchestra. Already a commanding visual presence as she tilts back on her stool, long wavey hair flying, Badi creates sounds that literally seem to come from thin air. And it isn’t a novelty. It’s musical. It’s spell-binding. It’s as much a new science as a new art form. It’s Badi-genics. Where do those sounds come from? I have no idea.